If you had told me 8 years ago that moving to Los Angeles included a city surrounded with breathtaking hiking spots, I wouldn’t have believed you. Los Angeles is the perfect city because you can escape into the wild so easily, from Malibu to Griffith Park. I am constantly discovering new hikes in the mountains and canyons around our city that bring peace and contentment from the traffic. Here are some of my favorite hikes you can find in your own backyard. WOW wow WOW! By the time I got to the third waterfall and hung on to a rope to help me scale up a straight rocky part of the trail, I thought I was in Hawaii. The moss covered rocks scaling up were dripping with this lush waterfall that formed a small pool you could actually wade in. When I was there a guy actually scaled the side of the rock and clung to a giant root to get to this one section where you can hang out behind the waterfall in what looks like a cave. The first part of the trail descends down the end of a dead end street with some of the most spectacular homes (sprawling mega mansions with tennis courts, guest houses, batting cages, and kid play areas bigger than a schoolyard). I didn’t know the trail was there at first. You have to park your car in the small parking lot immediately on the left hand side on the road called Winding Way. You walk for a half mile on this scenic road to get to the dead end. The first part of the hike has you crossing several small rivers and enjoying the peaceful woods, kind of like a back yard in Connecticut until you come to the first waterfall and then it get treacherous. I wouldn’t take children here or up the steep grade because you have to hike and climb straight up for quite some time often hanging on to rocks, roots, and tree limbs for support. This hike is an easy flat hike til you want to scale to the second waterfall. So worth it. The sun was setting. There were not many people around and I seriously felt like I was not in LA. After the nice guard informed me I had to pay to park my car at the state park, he let me know where I could park on the street for free around the corner and enter on a different trail. I entered off the side road onto the Grasslands Trail with a gigantic canyon or perhaps the Santa Monica mountains in the distance. As I headed to the right there was water in the middle of the trail; the creek that winds through the park. Many deer and bunnies flitted about. I came upon a big watering hole, which I believe is called Century Lake and a dramatic rock gorge. This is an easy, nearly level, relaxing hike that spans 3.5 miles roundtrip to Rock Pool and 4.5 miles roundtrip to Century Lake. This spot is popular with moviemakers. The Tarzan movies and Swiss Family Robinson TV series were filmed near these 400 foot volcanic rock cliffs and Rock Pool. Apparently the rusty old cars from MASH are there too. From the Pacific Coast Highway, turn inland on Malibu Canyon Road and drive 6.5 miles to the park entrance or from the San Fernando Valley, take the 101 (Ventura Freeway) on Las Virgenes Road and continue 4 miles to the park entrance. If you live in the Hollywood area, the drive is about 30 + minutes north to the Santa Clarita Valley. I parked my car in this big dirt lot not knowing what to expect. Arriving around dusk, I wouldn’t recommend going alone like I did, but was happy to share the trail here and there with only a couple people on this 5 mile trek meandering straight up and around, then back down this breathtaking canyon. There is also a two-mile loop trek as well if you aren’t ready for the long haul. This was where oil was first discovered in California. Like La Brea tar pits, the oil is spurting out on many sections of this trail! Evidence of the fires that often happen can be seen with some of the charred trees. While hiking, I saw a few mountain bikers on the narrow trails, but surely if they made one wrong move, they would go off the canyon and break their necks. I saw a very loud hissing rattlesnake on the trail before scouring up and on the way down I saw a giant tarantula. The sun was setting and it was peaceful being way up in the canyon hovering high above the busy highway in the distance. On the way back down I got somewhat scared since all of a sudden the trail ended, the sun was almost set, my cell phone was dead, and it was getting cold. I followed the dried up river which was very similar to the narrows in Utah (two shear cliffs on either side of you) until I could find my way out. Every view from every point was spectacular. Escalating up the dusty trails, past occasional horses, spiraling above all the madness down below is an easy LA escape. You really do feel like you are in another world, not in a city. 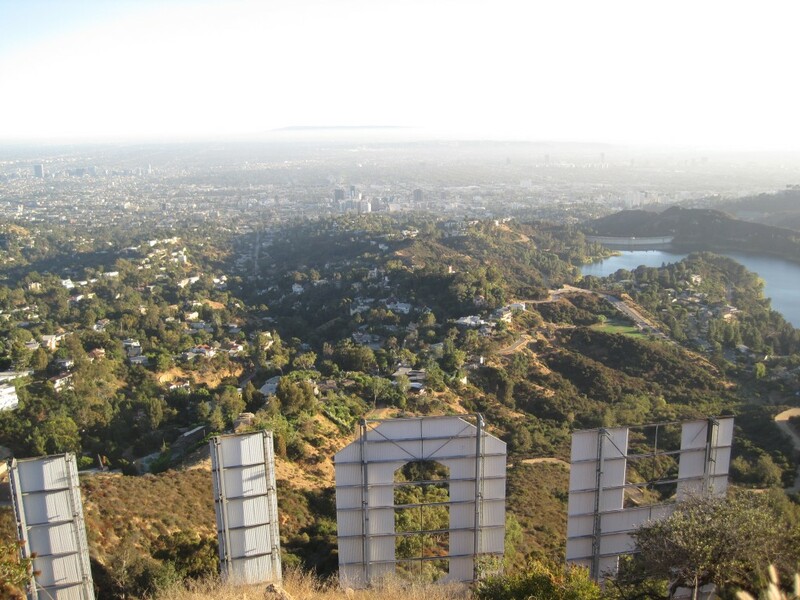 This is a moderately strenuous hike, but well worth seeing the Hollywood sign up close from behind and the views of Hollywood, downtown LA, Griffith Observatory, Burbank, Forest Lawn cemetery, and so much more. The actual sign is restricted and you can’t jump over the fence with all of the cameras right there. wood Drive and Hollyridge Drive. Walk up Hollyridge Drive to Hollyridge Trail’s start on the left. Following the ridge leads to Mulholland Trail, then to Mount Lee Drive and the best views from above and behind the sign. To get the closest view, drive all the way up Beachwood as far as you can go. Lately the roads have been blocked off, but park you car, and hike up the vertical street to get a super close view of the Hollywood sign. Feeling even more adventurous? Head to LA’s special Teahouse nestled in Griffith Park above the Observatory. 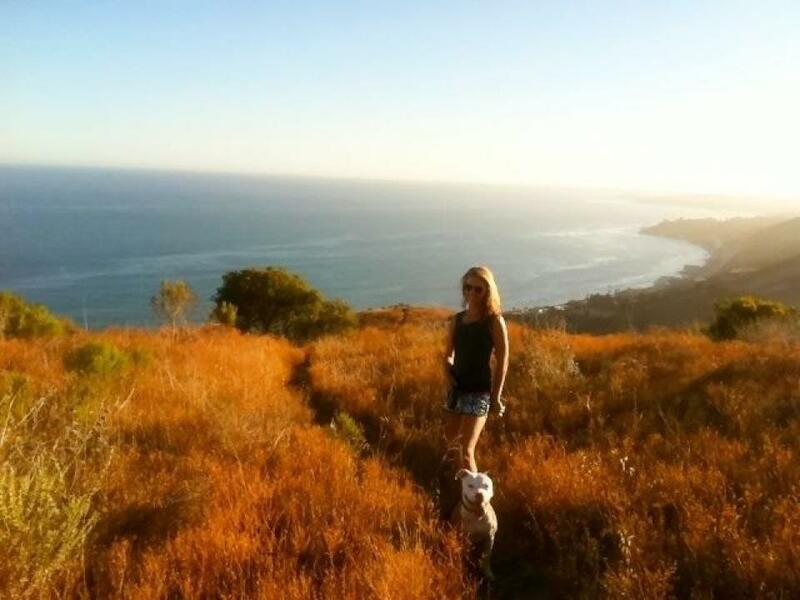 This is such a beautiful hike that when I lived in Pacific Palisades I use to to do this hike once or twice a week. The park fee seems to keep increasing in the state park, but many people just park outside in the neighborhood area and walk up. Check the signs carefully so you don’t get ticketed. Upon entering you will see the beautiful green field to your right where there are often polo and soccer matches. Head to the left up the trail or tour Will Rodgers old home next to a massive lawn where you can have a picnic or your kids can play, if you have the time. On your way up you will come to a point where you can only head right or left. Both ways are gorgeous The lined towering trees on the route to the right form a canopy while the route to your left takes you to a 360 degree view of gorgeous greenery, canyons, and the city all the way down to the majestic ocean. Often I have seen people on horses since you can rent them at the bottom. Bambi and her friends are out and about and don’t seem to be scared of humans. The spot at the top is called Inspiration Point, but more like a mesa or sweeping vista. It is a 2 mile trek round trip with 300 foot elevation. This spot is used on many TV shows and reality shows for a romantic picnic setting. From Sunset Blvd, take a right or left onto Will Rodger State Park Road and wind up until you run into the park. Drive up and up the windy Paseo Miramar Street off Sunset, park at the top, and walk up to the trail, which you may not see at first. This is a 7.3 mile pleasant hike that eventually will lead you to the Parker Mesa overlook in Topanga State Park. I hiked back the same way I came. The amazing views consist of the Santa Monica Bay, sometimes Catalina Island, and often inland as far as the San Bernardino Mountains. Here is a great hiking trail map for these Palisades hikes. This beautiful scenic 45 minute to one hour loop includes the Hollywood sign as well often the snow capped mountains in the distance. On a clear day you can see all the way to the ocean and Santa Barbara Island which is 45 miles west of Santa Monica, the San Jacinto peaks way east, the San Gabriels and the downtown Long Beach skyline. There are a few different trails you can take, one extending up at the top that leads you to views of the valley as well. It is always full of native Angelinos, many with their dogs and can be truly a Hollywood scene. This is a great place to bring an out of town guest so they can experience true LA. Celebrity types can often be spotted as well as many reality TV shows are filmed here. You can also enjoy donation based yoga daily (tip the yogis of course) offered several times a day surrounded by palm trees, butterflies, gophers popping out of their holes, and all sorts of interesting personalities around you. The yoga classes are in the dog park at the bottom of the canyon and are poo poo free. I have nicknamed Runyon “Six Pack Canyon” or “Poo Poo Canyon” since there are so many dogs that it often smells like doggy doo doo on the road up to the canyon on N. Fuller. Also, many people have their shirts off or workout bras so you can be dazzled by many flat tummies and the fabulously fit LA scene. Once I saw a few tiny snakes near the chair at the top and even when the sun was setting a white pony with a goat and a dog. Not kidding! A surreal sight with the city below and the sun setting. Once I watched in amazement as a guy scaled the canyon from the inside bottom and literally climbed up the canyon hanging on to roots and rocks to hoist himself up a straight incline. Not safe, so don’t try scaling. Another time at the top of Runyon a swarm of bees flew right through me. Be on the lookout for the rock formation often in a peace sign that you can view at the bottom of the canyon, looking down from the top. This is a great workout. Often I head right on the trail towards the first bench look-out with insane views before climbing straight up (great for the legs) and heading to a giant bench overlooking LA LA land, then you can circle around the canyon downhill or head right up for a longer trail walk to see the valley from the other side. If you choose to start out at the bottom of Runyon by heading on the left, you can scale one of the trails that leads straight up, which leads to a bit of scaling up a major rock incline and passing a deserted mansion. You will find a wish box where people write their wishes at the peak too. If you forget your water bottle, make sure to bring a buck or two because a writer who lives next to the entrance of Runyon on N. Fuller stocks the entrance with water and fruit daily with a suggested dollar or more donation. One of my favorite hikes in LA has you looking to the valley and to Los Angeles with a sole pine tree on top of Cahuenga Peak. Park on Lake Hollywood drive from Barham Blvd, then walk through a neighborhood on Wonder View Drive to the entrance. This switch back trail appears harder than it is, although it is quite steep. Be careful on the narrow path with loose rocks. The few is spectacular and a great hike away from city life. It only takes about 30+ minutes from the base. My first time there included a massive American flag hanging off the edge near all of the notebooks filled with fascinating quotes, memories, and advice from those who have come and gone, reminding us of the wisdom of Los Angeles. The Wisdom Tree is the only tree in the area that survived the devastating Hollywood Hills fire in 2007. 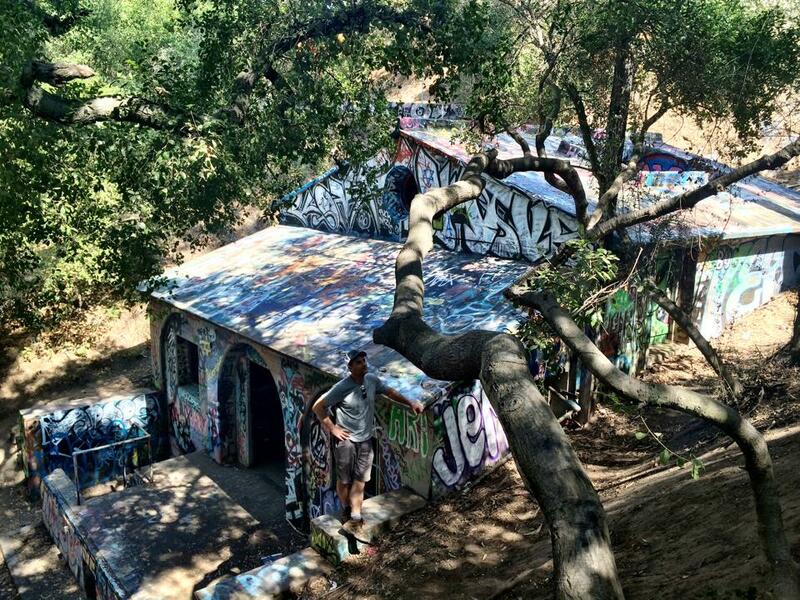 This special LA spot is peaceful with few hikers. Head through an abandoned Nazi compound nestled in the middle of the mountains for this almost 4 mile hike. As you careen down steep stairs and wind your way from one abandoned mystery after the next, you can imagine what life in California may been like when people thought Germany would win and take over America. Marvel at what remains of this graffiti-laden sanctuary from remnants of an old house, engine parts, crumbled huts, and an overturned ’40s VW Bus nestled into the woods. Park your car and pay a small fee right next to Malibu Seafood on the right hand side by the trailhead. Dogs on leash are welcome. I took smiling Chloe dog up this trail with sweeping Pacific Ocean views, although there is no shade so it gets quite hot. Eventually the trail becomes single file and narrow, but gaze in admiration at the waves and mansions below. We turned around and came back the way we started. A quarter-mile off Pacific Coast Highway on Solstice Canyon Road is an oasis where you can discover an abandoned home surrounded with palms and non-native plants that are still flourishing. I managed to jump over a long stretched rattle snake on a pretty flat stretch, which you can walk/hike for about 3 miles. Flowers are abloom and you pass over a creek. 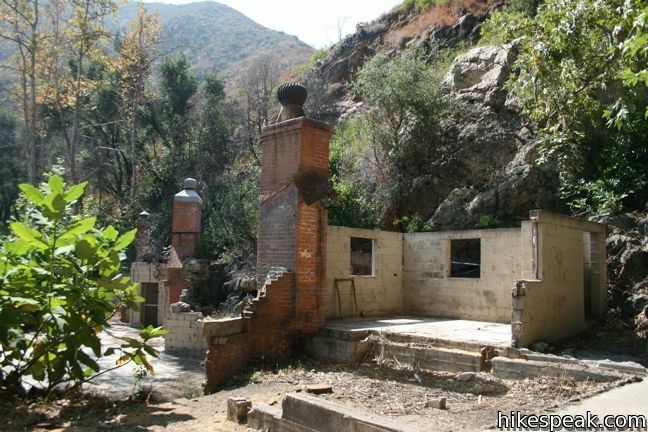 You will come across a somewhat spooky reminder of what once was – a brick chimney and the first remnants of the “Tropical Terrace” / Roberts Ranch House where you can still see several walls, stoves, and furniture. The ruins of this ranch home are the result of a fire in 1982. Apparently there is a harder Rising Sun Trail or Deer Valley loop with more sunlight, ocean views and a waterfall (that I never saw) behind the building. I got lost many times, but just decided to hike around and enjoy the views, from the Franklin Canyon Resevoir to the city skyline. This public park located near Benedict Canyon boasts 605 acres and sits in the center of Los Angeles. There are numerous trails to help you forget you are in a big city. 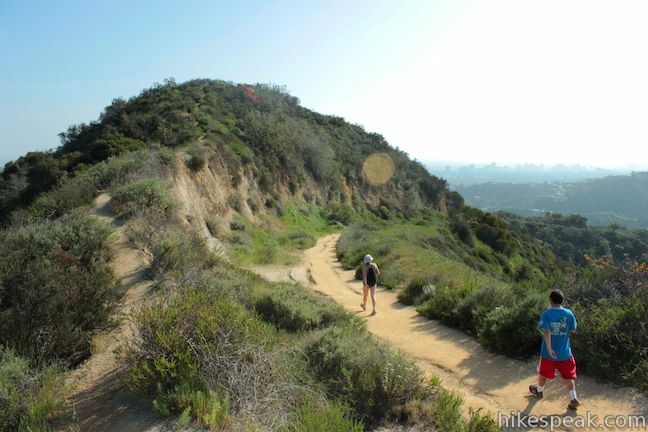 Bring water, wear sunscreen, and enjoy all the hiking that LA has to offer! Escape the city for some nature vibes.